I finally got to finish my solera or workboard that the guitar will be assembled on. It is basically made out of three sheets of 1/2" Baltic birch plywood laminated together. 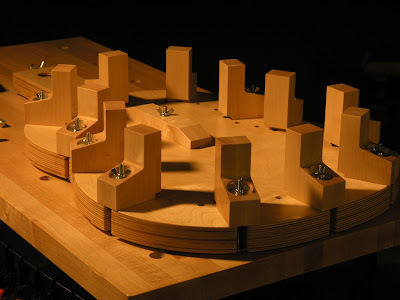 The blocks are made from maple as is the soundhole clamp. 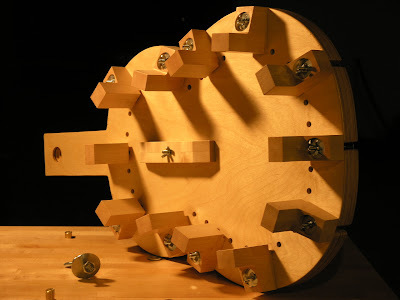 The blocks sit in slots that have been cut around the rim of the workboard and can be positioned to accommodate various guitar shapes and sizes. 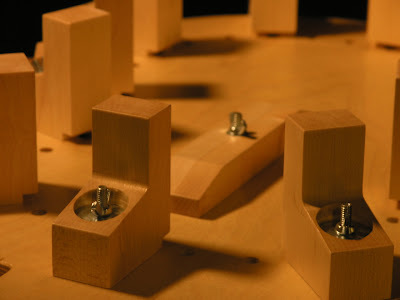 The hole in the end of the neck extension allows the workboard to be bolted to a bench for easy access from all sides during the construction process. 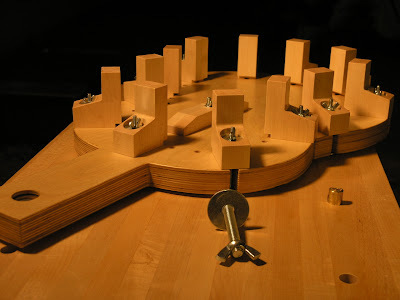 The holes between the blocks have been drilled to allow the use of spool clamps when the back of the instrument is glued on. As with the plan, this concept is also from Roy Courtnall book. However, I chose not to hollow the face of the workboard out, as Courtnall suggests, in order to accommodate the dome that will be build into the soundboard. Instead, I'll be using a cork shim to lift the soundboard off the solera. The reason for this is that I still haven't made a decision on how to deal with all the complications the construction of a domed top entails. The cork shim also appears to be a simpler and more versatile approach.